1. Flat=The print is mounted on 3/8 fiberboard and laminated. Then the edges are trimmed and beveled; you can select different edge colors (shown below) to match your decor. 2. Float=The print is mounted on 1/4 fiberboard and placed on a back frame. 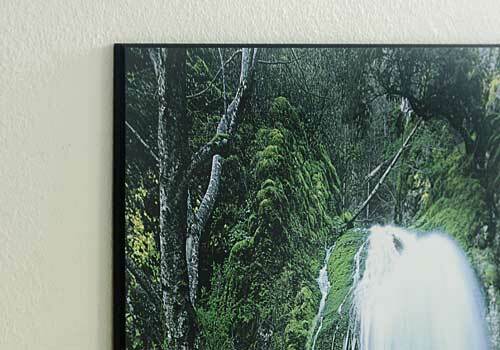 The result is an image that floats one inch off the wall. Again, you can select different edge colors (shown below). Below is list of available edge colors. Below is a sample of a Flat frame. Below is a sample of a Float frame. The Mountain scene is displayed about 1" from the wall.